The Conflict of the Faculties: Scarcity and Competition in Higher Education. Check out the extensive list of books by SVHE members. Continue reading "2019 Call for Papers Deadline Extended!" Continue reading "Can Values be Taught through Style? Read what SVHE Fellow and Board Member Melly Howard thinks in the latest Forum post." Continue reading "New! SVHE Photo and Video Policy"
If “interdisciplinary” connotes anything, it should be improved communication across disciplines that foster mutual understanding. This, in turn, advances our understanding of the deeply complex ethical and moral issues facing our world today. Acknowledging the need for diversity and integrity in speaking to these issues, Soundings promotes dialogue, reflection, inquiry, discussion, and action. These activities are informed by scholarship and by the acknowledgment of the civil and social responsibilities of academe to engage the world beyond the ivory tower. Affiliated with the Society for Values in Higher Education, the journal has recently moved to Western Kentucky University, where it is edited by Eric Bain-Selbo, Anthony Harkins, and Jane Fife, all of the Potter College of Arts and Letters. Soundings: An Interdisciplinary Journal invites essays on topics related to any and all aspects of human values, including aesthetic, moral, political, economic, scientific, or religious values. We welcome work from a variety of disciplinary and/or interdisciplinary approaches, including the arts, cultural studies, history, literature, philosophy, and religion, among others. To submit a manuscript to the editorial office, please visit www.editorialmanager.com/soundings/ and create an author profile. The online system will guide you through the steps to upload your manuscript. Click here to subscribe. 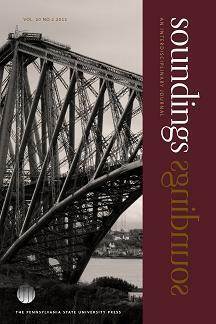 A subscription to Soundings is included with membership to the Society for Values in Higher Education.